Welcome to Big Sky Chicken Ranch and Victory Garden! Hope you enjoy this rambling and heart-felt chicken page. The original goal was eggs, and I so want to be a pragmatic farmer-woman. But the chickens are sweet pets. Darn their cuteness! With their simple minds and basic needs, the chooks bring joy to my daily life. Ya can't take yourself too seriously when you're chasin' a chicken! I love BYC! It's a treasure trove of good chicken people and good chicken information. 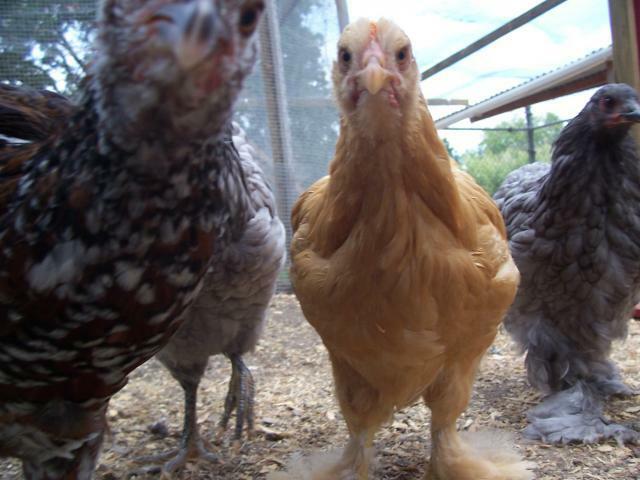 The chickens have enriched our lives in ways we didn't expect. Like the nice farmer man says in "The Natural History of the Chicken" movie: chickens just bring a certain life and energy to the farm. Pecky-Sioux stopped laying a couple of months ago. We were able to determine that she was an "internal layer". That meant she was laying eggs inside herself, and it was only a matter of time. We had to put her down on 8/29/11. You were a very good chicken. Rest in peace, sweet girl....thank you for the eggs. Chickens come and chickens go.....that's why we have a couple extra girls. We lost Sioux-Bawka on 9/28/10. She had trouble with her leg as she was growing up, and was often tired. If I were a thrifty chicken farmer, I would have "done the deed" long ago. She was not vigorous, like a chicken should be. Our lame girl spent her days in the chick pen, next door to the main chicken run. 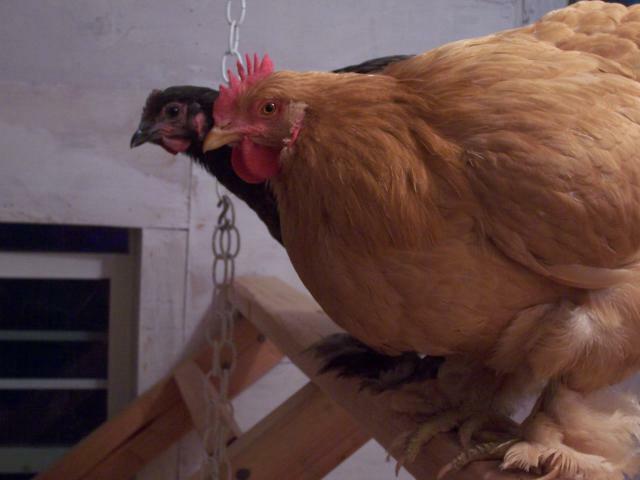 At night she slept in the hen house with her sisters, even if she could not roost. I was soft-hearted and took her to the vet (not very thrifty!). The vet gave her antibiotics, which seemed to help, a little. 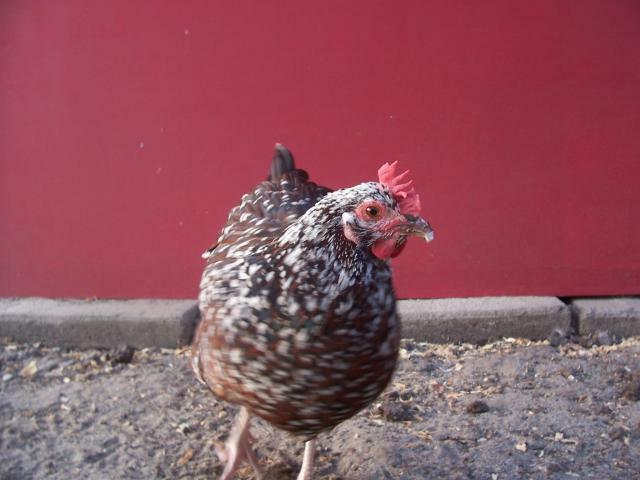 Sioux-Bawka was a very happy chicken right up to the end, free ranging with her sisters and eating strawberries. 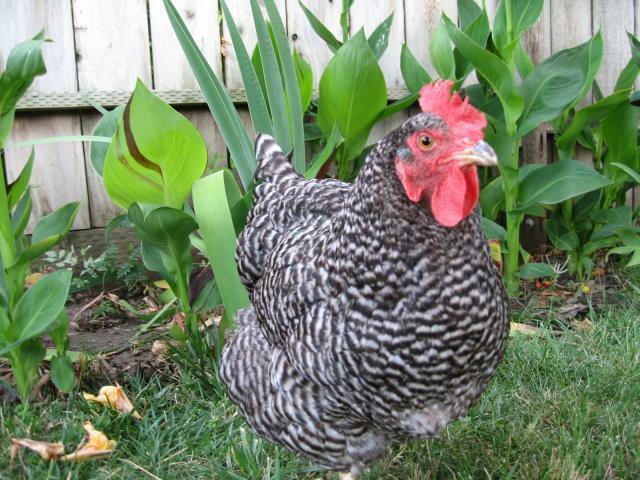 RIP, sweet girl, and thanks for the eggs. Integration is complete. We started free ranging everyone together first. In August, we cut a doorway between the chick run and the chicken run. The little girls enjoyed laying eggs in the main chicken house, and the big girls really liked hanging out in the chick pen. 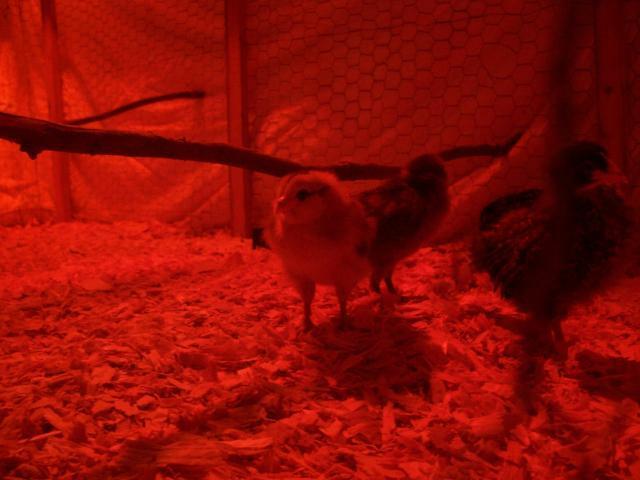 After a couple of weeks we closed the chick house and got little girls to sleep in the main hen house at night. It only took them a few nights to learn how to roost with the big girls. 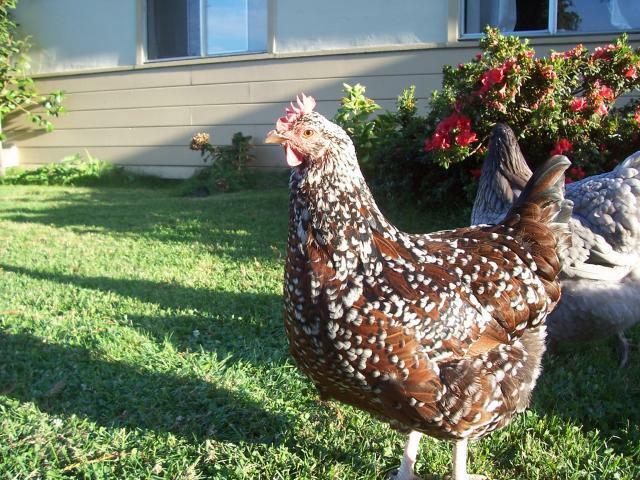 Gobbles (Speckled Sussex) 6.4 lbs. Tammy Wynette (Blue Wyandotte) 8.8 lbs! 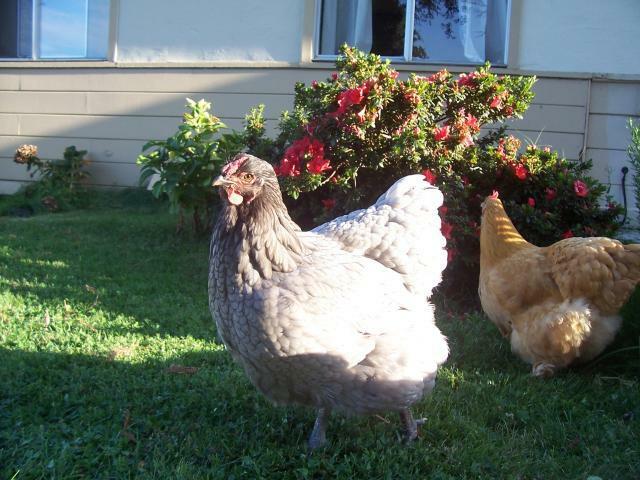 Cordon Bleu (Blue Cochin) 5.2 lbs. Bawky-Sioux (Barred Rock) 3.6 lbs. Pecky-Sioux (Barred Rock) 4.4 lbs. 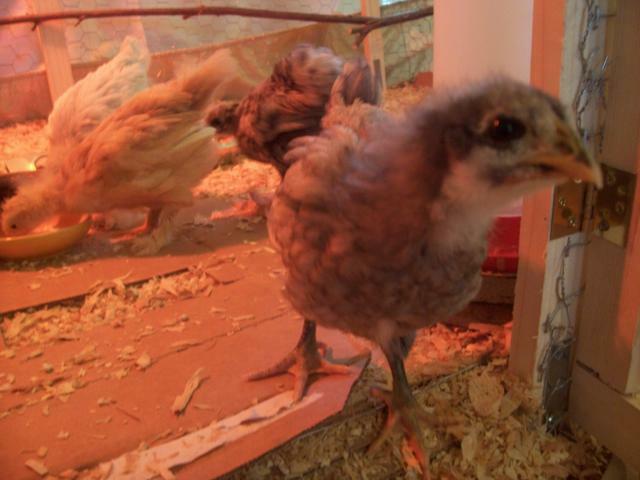 Sioux-Bawka (Barred Rock) 3.6 lbs. Gener (Easter Egger) 3.6 lbs. Deaner (Easter Egger) 3.4 lbs. Here is DBF building the new "Little Girls Run". 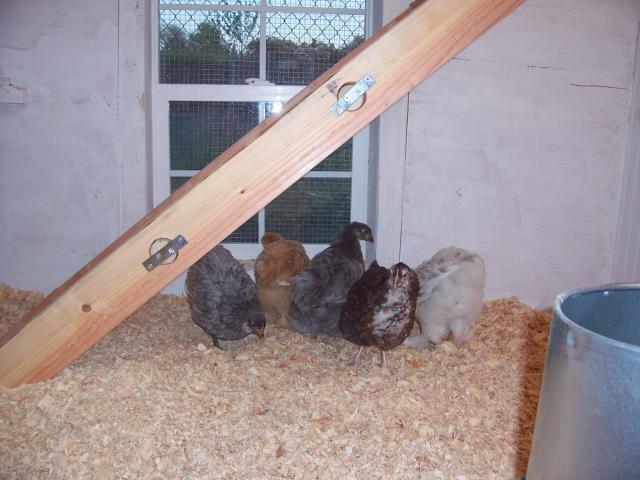 7/1/2010: The big girls and little girls have been free ranging together. Things are going well. Just a few enforcement pecks from the big girls, but nothing serious. We must wait a while to integrate them in confinement, but free ranging together is an excellent start. The little girls are getting very skilled going in and out of their run for free range time. They are learning to love scratch! 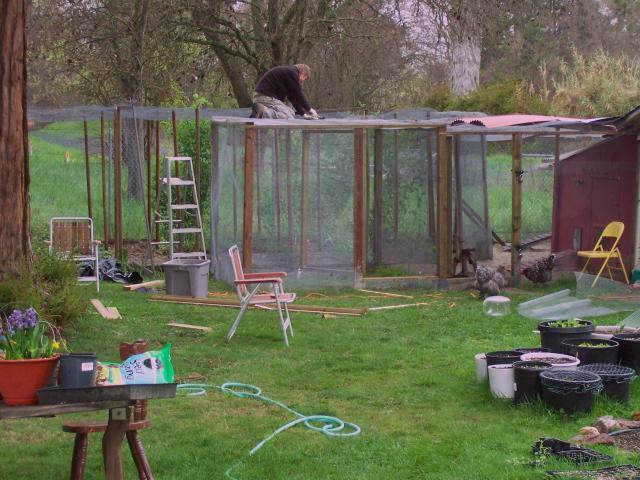 6/6/2010: The Chicken-Chalet is near complete! We've had so many hawk visits lately, I had to do something. The girls will hang out in the chalet when we can't be out in the yard to supervise them. We also want to bring the chickens out to the front yard, but the neighbors have dogs. The thing weighs a ton! So solid and safe....a hardware cloth skirt is the only thing that could make it safer. 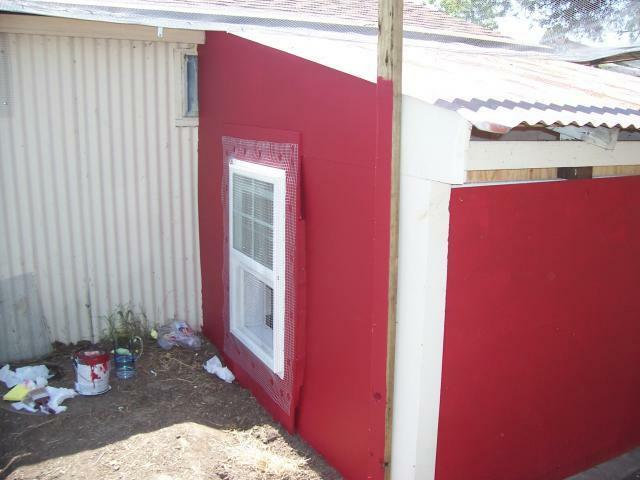 Thanks to John, who took his construction skills to the next level with the peaked roof. 6/4/2010: The little girls are doing great. They are 9 and 11 weeks old now. The ramp to the chick-haus is pretty steep, but they are getting better at it every day. Chickens are so incremental in their learning - it's really neat to observe. 5/14/2010: The little girls moved outside today! WooHoo! 4/21/2010 - Bawky and Pecky have been bumping chests the last few days. I saw them doing it tonight.......and then I saw Bawky-Sioux very calmly give Pecky-Sioux a peck in the eye. It made me smile. I just KNEW Bawky was number one. 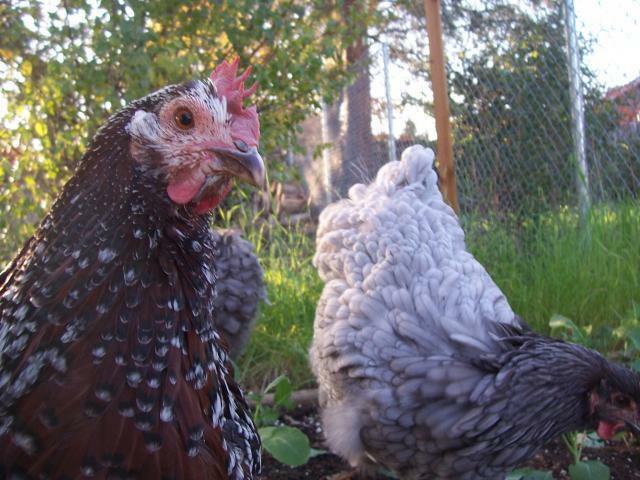 4/11/2010 - We integrated Deaner and Gener (easter eggers) with ther Sioux Sisters and they are getting to be a tight little flock. 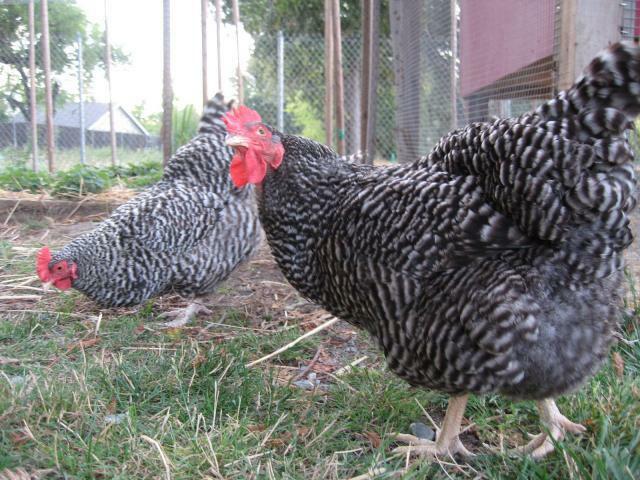 We are taking care of the three barred rock's for a friend who is in Europe for a few more weeks. Introducing the Sioux Sisters: Bawky-Sioux, Sioux-Bawka and Pecky-Sioux. "Oooh, baby, look at you - don't you look like Siouxsie Sioux!" The new girls rock! And not just becuase they are Barred Rocks. 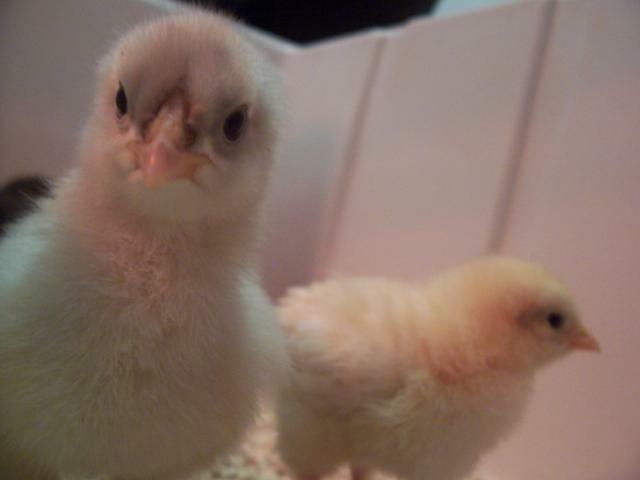 They are such cute little peepers, even though Pecky-Sioux is already giving me the "Roo Eye". Hopefully she is not "Pecky-Roo". Bawky-Sioux is the most mellow, but clearly in charge. Sioux-Bawka is the smallest, and very curious. Their peeping and twittering makes my house really fun and ALIVE. 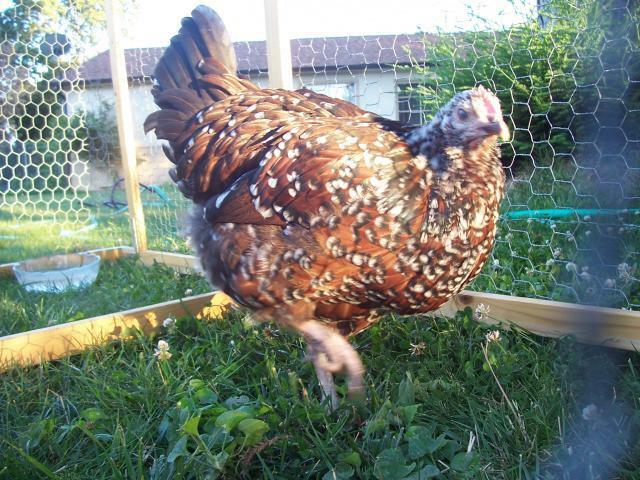 Buffy the Bug Slayer (Buff Cochin): We lost Buffy Lou on 11/29/09. She was fine at 7 a.m., but DBF found her keeled over in the run at 9 a.m. We chose not to send her to UC Davis, due to the fact that her death seemed non-contagious. We would have had to wet her feathers with soapy water and keep her in the fridge, and then ship....it was just too much. DBF dug a nice deep chicken hole. I wrapped her in a beautiful Turkish scarf, and we buried her with some roses, scratch and oats. I was trying to be a tough farmer-woman and take care of business, but I have to admit, Buffy's passing made me sad. That is life on the farm! Chickens come and chickens go. A couple days passed and I felt much better, and grateful for the experience. Rest in peace, Sweet Buff! You were a good little chicken. We will miss your your superb bug-slaying abilities. 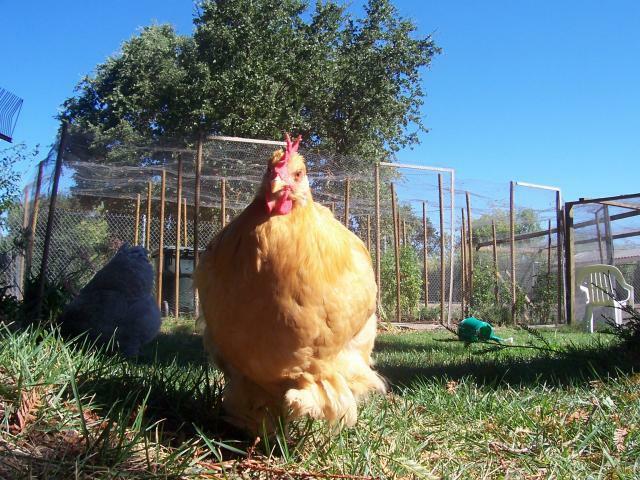 THANK YOU, Buffy, for giving us over 75 eggs! 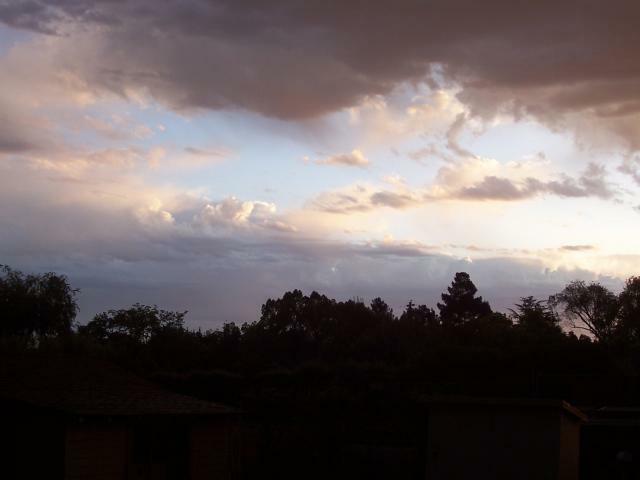 The picture above is from June 30. Buffy's got the eagle-eyes - kinda menacing. Food was a priority for Buffy since she was a chick. I would see her at the feeder, when the other chicks were dozing. She would munch away while happily singing to herself. 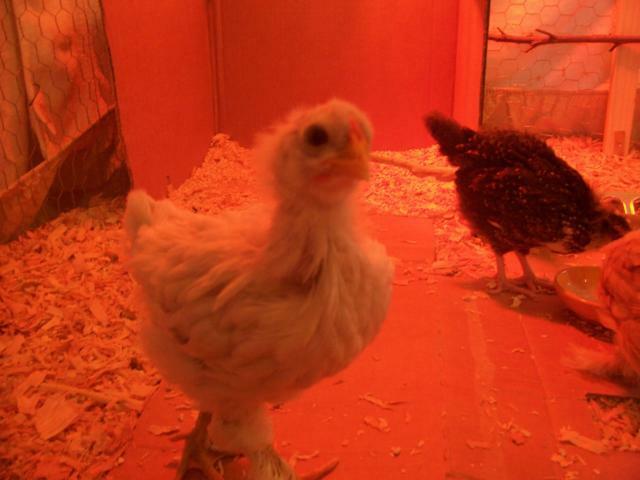 She was also a little shaky as a chick. She had perfect little angel wings, and I called her my special, shaky, singing angel. Here is Buffy wishing everyone a Happy Easter! 8/3/09 - Buffy is getting really beautiful. She's very red around the eyes, and her buff color is becoming very golden. 8/12/09 - Buffy-Lou was SO loud this morning! Surely she will be laying soon. We thought she looked like a turkey, so we named her after Timmy's Thanksgiving Rescue Turkey on South Park. She gets very quiet when I'm holding her and stroking her on the chest. Sometimes she just looks out the top of the run at the redwood trees.....I think she's daydreaming about flying up and away......I love her white spots. She has black/blue/green irridescent feathers which look incredible in the sun. She escaped the run AGAIN yesterday when I was bringing in water. It was not as scary as the first time she escaped She got about two feet past the gate and promptly started munching on the lawn, which made it very easy to round her up and put her back in the run. 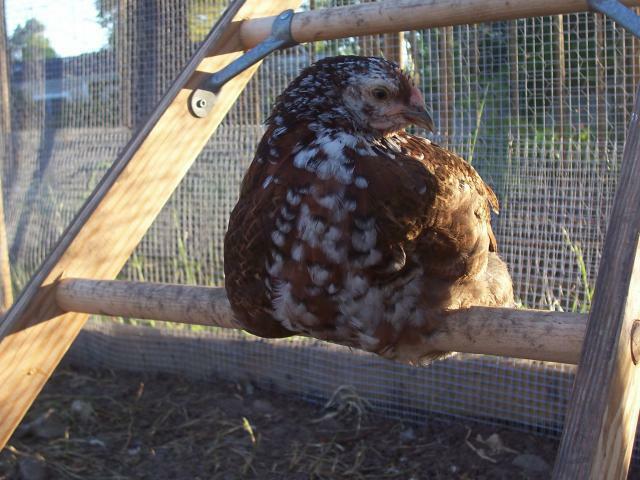 7/21/09 - The other day when Gobbles was in the chicken tractor, I noticed she was poohing liquid. Last night I checked her crop and was alarmed to find it HUGE and hard. I gave her a little olive oil and massaged her crop. Thanks to lurking on BYC, I knew to try the olive oil and massage, and was a lot less freaked out by her temporary deformity. It was gnarly! She seems to be better this morning, but DBF will keep an eye on her today. I feel bad, she had too much grass, the last few days.....from now on, we will take tractor time in moderation. It was just so hot last weekend, that keeping them in the shade on the lawn seemed like the best way to keep them cool. 8/31/2009 - Gobbles pecked one of her eggs yesterday! Luckily, the inside membrane did not break. Hopefully that experience taught her that eggs are not worth any further investigation. 9/9/09 - Gobbles must be feeling secure in her #1 spot, because she's being nicer to Cordon Bleu, and she likes to be held once again. She has very elegantly shaped, soulful eyes, which I think, is part of her beauty. Her comb is becoming very floppy, and she constantly bum-rushes the run door, when I open it. 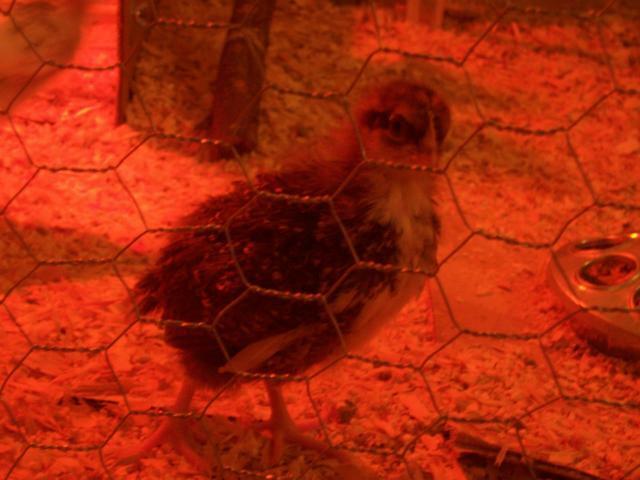 1/1/10 - Gobbles is really filling out. She's looking very broad-breasted. Her white speckles are coming in as she's finishing up her molt, and she's looking really awesome. She's been squatting for me again lately, so I'm hoping for an egg or two per week this winter. 2/9/2010 - Gobbles Girl weighed in at 6.8 lbs. last weekend. Go on girl, you keep those winter eggs coming! I'm getting about 5-6 eggs a week. I think it is all Gobbles, but I'm not 100% sure. 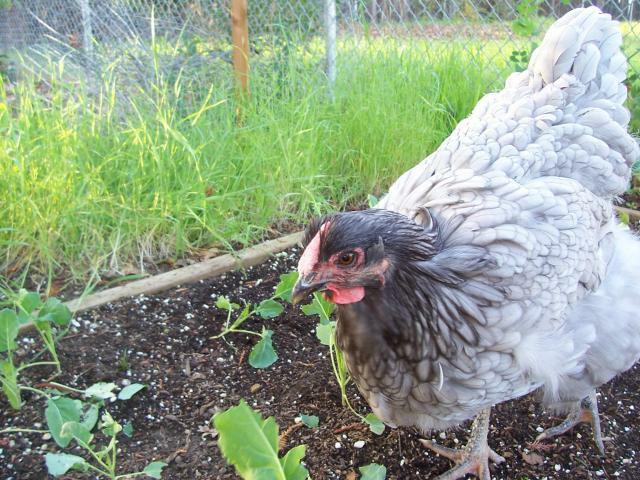 Tammy Wynette (Blue Wyandotte): We named her for the pure alliteration of it. There isn't much to say about her personality......She's always been large, and she's getting kinda dumb as she matures. She has huge reptilian-looking feet and legs. She's always been fast and the most difficult to catch. 8/3/09 - Tammy-Lou has a really funny voice. Her song is a super high pitched peep that changes pitches but is continuous. Very odd. Reminds me of Mariah Carey. She's been doing the laying squat which makes here much easier to catch these days. She's also getting much calmer in my arms. 8/26/09 - I had to wash Tammy Wynette's bum yesterday morning! Well, not her actual bum, but the feathers below it. She had too much poo stuck to her feathers! DBF held her while sitting on the edge of the bathtub. I used a bowl of warm water and baby shampoo, pouring it over her feathers, and working the icky bits out of the feathers. Gross! I had to be careful not to pull the feathers. I was SO nervous, trying to finish ASAP. Chicken skin looks so, uh, vulnerable! After a while, she was warm and relaxed, happily clucking away in DBF's arms. We mostly dried her bum with the hairdryer on low, and put her back with her sisters. She looked great this morning. 9/9/09 - Tammy is the champion egg-layer. I think she has layed for 15 days in a row! I told her it's OK to take a day off. She is also getting prettier. Her rose comb is developing, and she has funny little whiskers between her wattles. She's at the bottom of the peck order, which is amazing considering she is so much larger than Cordon Bleu. Tammy Wynette , pictured below as a chick. Broody Tammy giving me the "broody-stink-eye"
10/17/09 - Tammy still has her cute little Mariah Carey song, but she's adding a matronly cluck to her vocabulary. Tammy is our manly looking chicken. 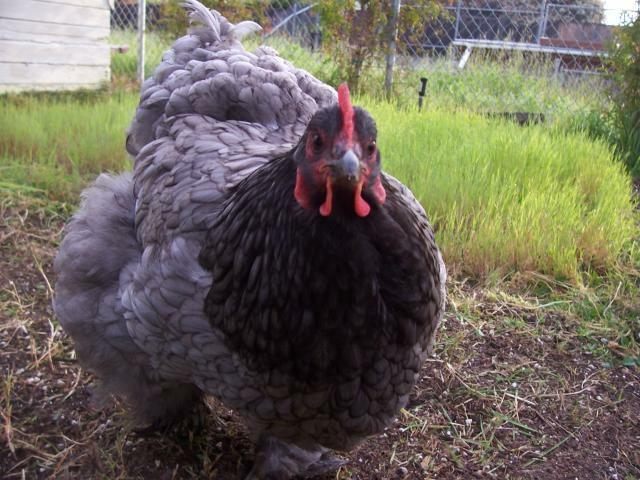 She has funny feathers in between her wattles that look like a beard. And the feathers next to her comb stick straight up. 2/21/09 - Tammy Lou found her voice this weekend, and boy did she have something to say! I counted over 60 bawks in a row - amazing. 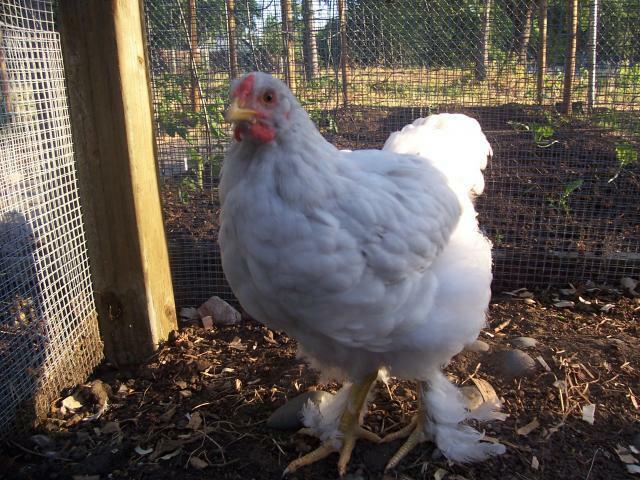 Cordon Bleu (Blue Cochin): She is SO shy, I mistakenly thought she was at the bottom of the peck order. She's funny looking becuase she's almost all feathers, and has a permanent "deer-in-the-headlights" expression. We call her our funny little clown-chicken. She started "honking" at 10 weeks or so, and lets out adorable little squeaks when she's trying to avoid being caught. She's the most snuggly ball of feathers. I call her Bleu-Bleu sometimes, and she is the only one who recognizes her name. 8/12/2009 - Bleu is getting beat upon by head-girl Gobbles. No blood yet, but It's so bad that she won't even eat food off the ground when Gobbles is near. And Bleu is so nervous, she sometimes flinches or runs when Gobbles walks by. We try to make sure she gets special treats. 8/26/2009 - I had a talk with Miss Bleu last night and told her that all the other girls are laying now, and I expect her to start soon. Her peep is a tad lower this week and her small comb is finally getting more pink. 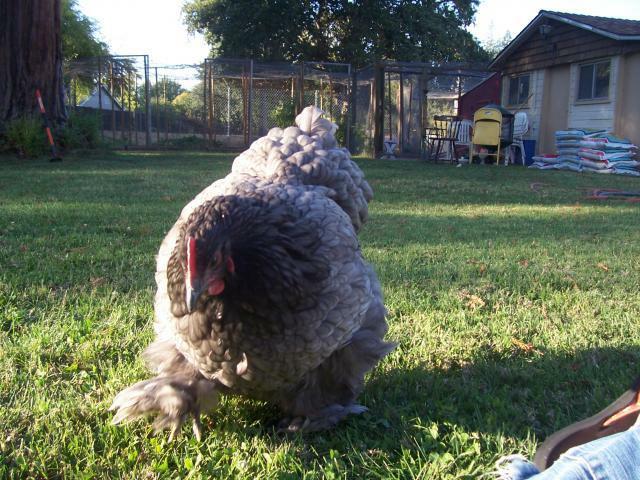 9/9/09 - At 24 weeks old, Miss Cordon Bleu is not laying yet. 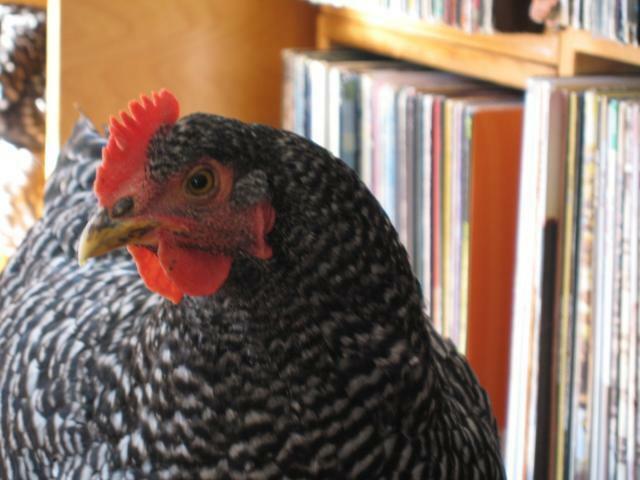 We've been calling her "rain-chicken" this week, as she seems so distant, but possibly super-smart. She is getting that lovely, puffy, Cochin shape and has a gorgeous dark grey collar. 2/9/2010 - I weighed everybody last weekend, because I want to be sure Cordon Bleu is not falling too far behind the other girls in size. She's so small and just a bundle of feathers. 5.4 lbs. which is a gain of 0.3 lbs. in the past 6 weeks. 9/22/09 - Still no eggs from Miss Bleu, but that's OKAY. She will start when she is ready. She's such a feathery little snuggle-bun, even if she never lays a single egg, we will still love her. She cracked the tip of her beak this week (don't ask me how), but she's fine. I think she filed it smooth on the concrete pad that is in the run. 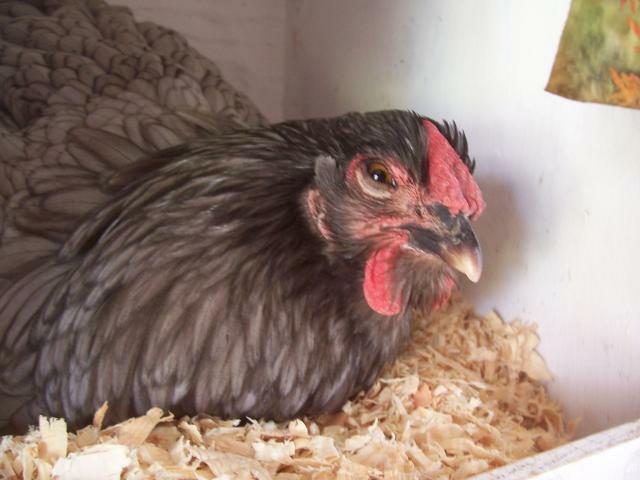 2/23/09 - At the age of 11 months and 11 days, Miss Bleu laid her first egg yesterday! A lovely 48 grams. I am SO proud of her. It must have been a surprise, because she dropped it near the gate to the run. I found it this morning. Glad I did not step on it when I was taking in the feed last night. 2/24/09 - Bleu-Bleu was hard at work in the nest box this morning! What a good girl! Yesterday, 7/26, about 2 p.m. I heard a fuss coming from the chicken run. I went to check it out and it was Miss Gobbles, pacing back and forth, and being VERY vocal. 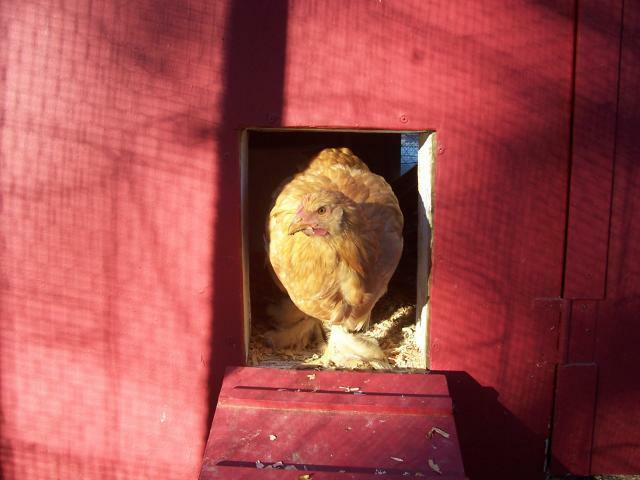 She went inside the coop, paced back & forth in front of the nests a bit, then hopped in. I told DBF that I thought Gobbles was trying to lay an egg. He very nicely suggested "you should leave her alone....." That sounded like good advice, but she looked pretty uncomfortable. Since it was warm, and DBF was out at Home Depot, I could not resist bringing her some water. She says......."OOOOHH, whaaaaaat is haaaaapening?!?! I'm so stoked, I got to witness the miracle of nature! A 1.3 oz egg (pee wee sized) from Miss Gobbles. We fried the egg 3 hours later and ate it on toast - me, DBF and a chef friend. The yolk was very rich and creamy, and the egg shell was extremely hard. DBF dug them a deluxe dustbathing pit. Covered the sleeping shelf with vinyl flooring as it was getting to "poopy". Coated the bottom of all perches with a solution of 2 parts linseed oil and 1 part kerosene. This is supposed to discourage mites. I've also put down at least 200 lbs. of sand in the run over the past month. It makes scoopin' poop a bit easier. DBF bought me an awesome rake for the run. 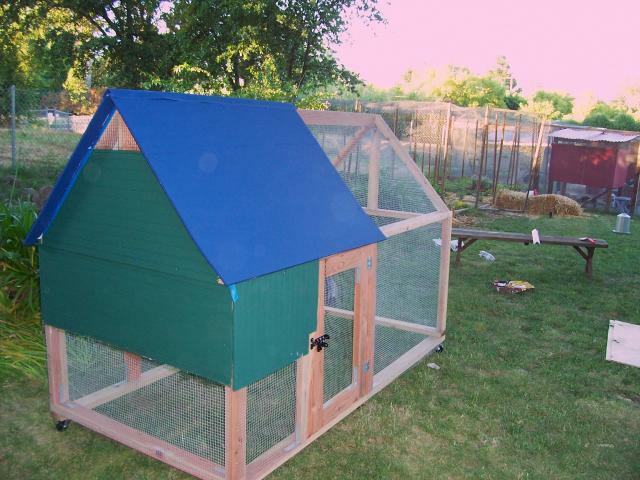 It's rakes the poo without removing so much dirt, and is wonderful for moving pine shavings around inside the coop. More hog rings! I love hog rings. (special pliers needed) I bought a box of 100 at Eames, and DBF used them to close up any gaps in the overlapping hardware cloth. RATS! We put more hardware cloth in the vent areas of the coop to better seal it off from rodents. I take the food into the house at night, and we've been setting traps outside the coop at night. This will be a constant challenge for us, as we live next to an open field. I refuse to use poison, it's just too gnarly! Put down another 200 lbs. of sand in the run in July. Another 200 lbs of sand in Sept. - we are almost ready for winter. Bought a kitty litter scoop - it really helps remove the poo without removing the dirt. DBF started on the automatic chicken door! Wow, what a guy. I'm so impressed with his progress. I'll post pictures just as soon as I upgrade to Golden Feather Membership. He got the drapery thing-a-ma-bob and installed it with a timer. We just have to get a drapery cord and it will be finished. 9/27/2009 - The automatic door is working! Door goes up, door goes down, door goes up, door goes down.........I wish it was a little more secure, but our run is totally bomb-proof. 10/18/2009 - We put a ventilation window in the people door. It has a sliding board closure, so we can close it when it's storming. I could tell the hen house did not have enough ventilation before. Now it smells nice in the mornings! 1/2/10 - The run was starting to get really compacted & low, and we didn't want it to turn into a lake, so we got 3 cubic yards of topsoil and 1 cubic yard of sand delivered. DBF did a heck of a job moving it all from the driveway back to the run. I only helped him shovel a couple wheel barrow loads. Okay, people, beware, when you create higher ground, you also create adjacent lower ground. 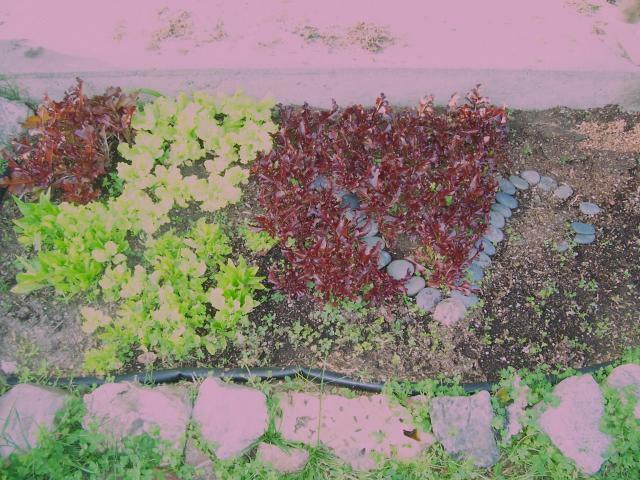 We found this out during the big storms January 2010 when the back yard next to the chicken-run started flooding. We dug a trench through the coop, and the yard drained. Whew! We will need to follow up with some more permanent drainage through the chicken-run. One day, after watching poor little Bleu get bullied in the tractor, DBF tossed out the idea of letting them out for a bit. The girls were so happy and free! 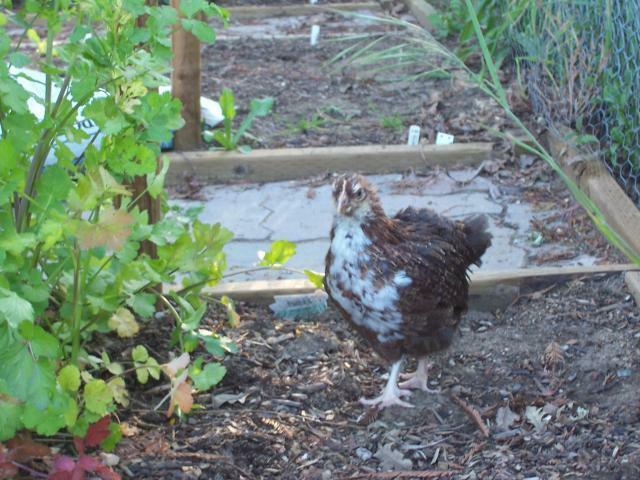 When I saw Cordon Bleu actually run and flap her wings just for the joy of it - I understood the joy of chicken freedom. DBF remarked, "the chickens are really coming into their own chicken selves." Yes, indeed, they are getting totally "chickeny"! 9/22/09 - The chickens LOVE free ranging! It is definitely an investment of my time (I supervise them while they are free ranging, becuase our back yard is not totally fenced in, and we have hawks), but so worth it! They are having SUCH a good time digging in all the flower beds for bugs. I put a portable fence around the wheat patch, and it's doing the trick so far. They are getting used to the freedom, and now pace back and forth in front of the run door when they see me come home in the evenings. 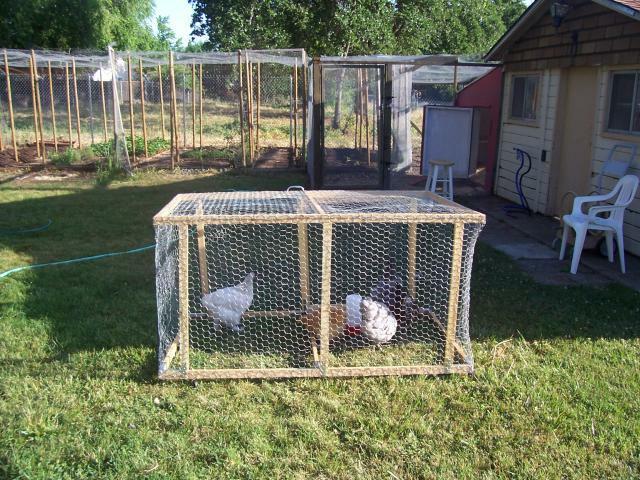 10/18/09 - The girls are used to free ranging now, but now that the days are short, they only go out on weekends. They like to shadow me while I dig up soil. They are totally spoiled, and get to eat almost everything in the yard, including wheat grass, pea vines, lettuce and spinach. For a couple of weeks, I've been working in the side yard digging up the summer beans and getting the soil ready for winter wheat. As we inched closer to the front yard, Gobbles finally spotted the expanse of the front yard. As her eyes focused intently on the new open space, her neck stretched upward. I could tell she was totally intrigued. She is so curious. I quickly shooed her away with the broom, and put up a temporary fence. The front yard is definitely off limits until I build a heavy-duty tractor. 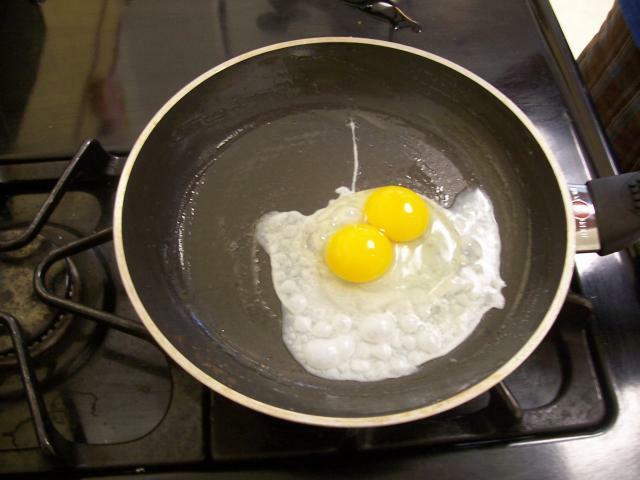 Chapter 12 Eggs (and what goes into them)!! 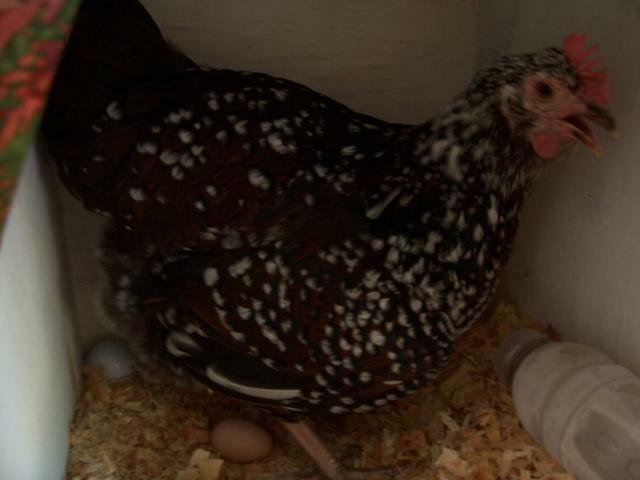 9/19/09 - We got our 100th egg today! 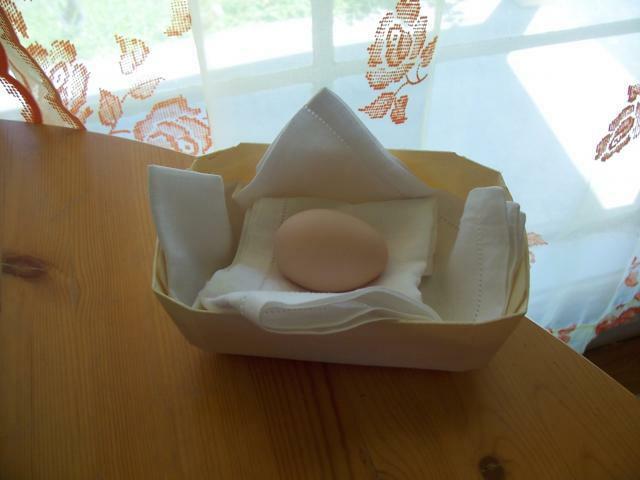 And DBF found an adorable chicken-shaped egg basket at a garage sale - hooray! 9/25/09 - Eggs are starting to slow down due to the decreasing daylight hours. 9/28/2009 - We have not had ANY eggs since Friday, 9/25. We had saved up 14 and made a lemon chiffon pie as the sort of season finale. The seasons are changing.......we're going to keep them on "au-natural" daylight this winter. 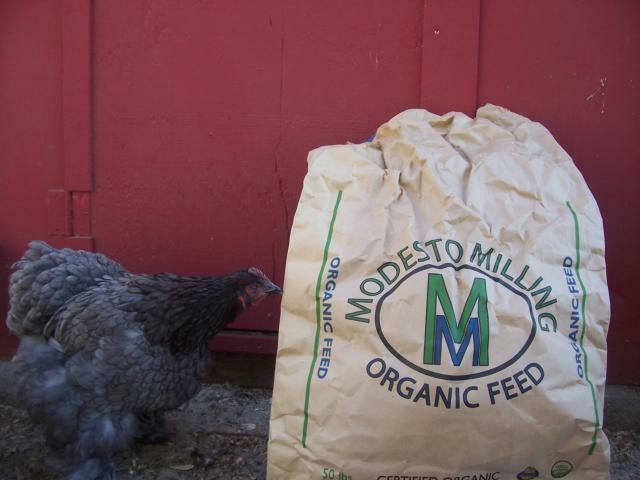 The girls have been on organic feed since September 2009. I think they like it better than the Purina, but my chicken-speak is not fluent enough to know for sure. I think the chickens' main concern is that I keep the scratch coming - organic or not.....I know that I feel good about giving them organic feed. Since I read "Plenty" by Alisa Smith and J.B. MacKinnon, I like knowing that their food travels from the central valley of California, instead of from the midwest. They have organic feed at Concord Feed & Fuel, but it's the "Organic Pride" brand made by Land O'Lakes which is owned by (guess who???) Purina! AND it is shipped from MO. I picked up the organic feed at: biofueloasis.com (at Ashby & Sacramento Streets in Berkeley) and they are great! They have canning supplies & books on gardening. But I don't like driving to Berkeley, so lately, I've been ordering directly from modestomilling.com. They are really nice folks. They took the care to ship my 50 lb. bag of feed in a box, so the bag wouldn't get torn. You can email them for a quote or call 800-897-9740 and ask for Chris Wagner in sales. Can you taste the happiness in your eggs??? The term homesteading is funny to me. While I know it's modern usage implies "living more simply and self-sufficiently", the term still makes me think of a massive 1860's LAND-GRAB! The 1860's homesteaders had to do it for real, because they couldn't just run down to the grocery store if the garden failed. I need to go re-read the little house on the prairie books. I love that this old-timey, back-to-the-land way of life is finding proponents. It's good for the earth, and good for us as humans, to.......just........S L O W D O W N. Growing stuff takes a long time, so it is getting me more in tune with the pace of nature. 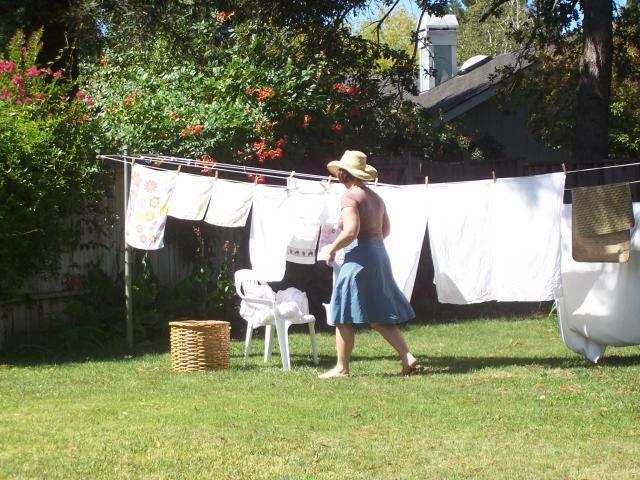 I get to hang clothes on the clothes-line........sometimes......Line dried clothes really do smell good! The lady who lived here before me was named Catherine (from 1949 to 2005), and she never had a dryer! Her grown children made her buy an electric washer in 1988 after she got her hand caught in the ringer one-too-many times. I just discovered hooks in the garage, which used to hold the "indoor clothesline". Our house was built in 1947 - that is relatively new, but we feel like archeologists sometimes. We are always "unearthing" stuff. We find old medicine bottles, pop tabs, tiles from our bathroom, etc. buried in the back of the property. 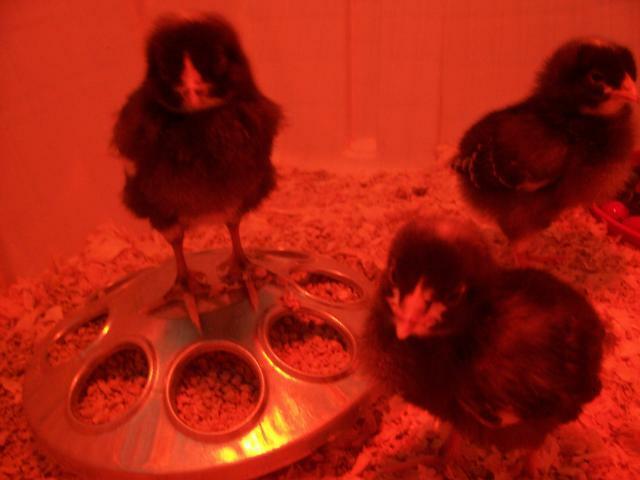 We picked up the chicks on March 14th, 2009 from Concord Feed & Fuel. 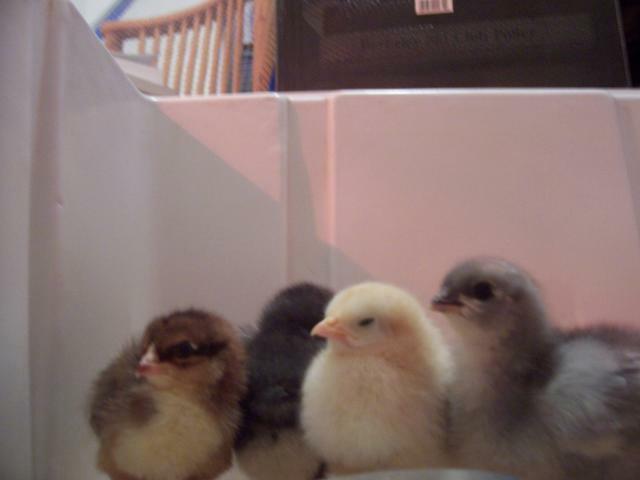 We chose 2 blue cochins, 1 buff cochin, 1 speckled sussex and 1 Blue Wyandotte. The nice lady at the feed store helped us gather our supplies: a feeder, a waterer, a red heat lamp, corn cob litter, and start & grow. We cranked the car heater to full blast, and felt like giddy new parents with our cardboard box full of peeping joy. Pictured above are Cochise and Buffy. Cochise was the "head girl" from day one. We chose her out of the blue cochin bin, becuase she was lighter colored than the rest (like a grey pearl), more active, and bigger. She turned out to be some sort of Splash Cochin mix. We had no idea she would turn out to be a COCKEREL. But this photo completely illustrates her "roo'itude". 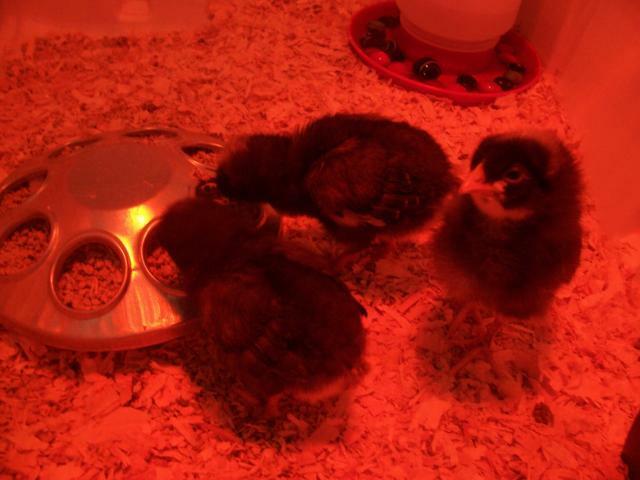 Pictured above: the girls.......Gobbles, Cordon Bleu, Buffy the Vampire Slayer, and Tammy Wynette. The amount of care they required surprised me. I thought I'd be able to leave them for a couple of days at a time, but I quickly realized they needed more care than that. I was checking on them in the middle of the night like one would check on a baby. I held them twice a day, so they would be comfortable around people. They were SO cute. We kept them in this nice brooder box to start. At about 3 weeks old, they were looking at the edge of the box.....ready to jump. I made a hardware cloth cover for the box while DBF and I constructed an intermediate brooder pen. 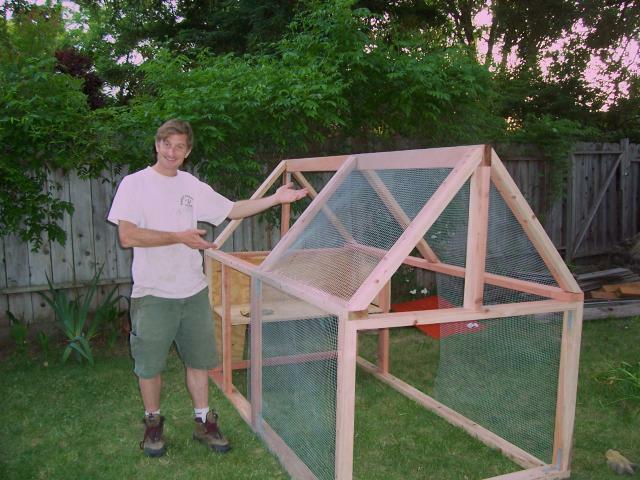 On March 19th we hastily finished the 3' x5' intermediate brooder pen that would eventually serve as the chicken tractor. I covered the floor with with pine shavings and put a fitted sheet around the bottom to keep them from kicking litter out of the pen. I put towells around the back and sides of the pen to make it less drafty. The first morning he crowed, I thought some neighbor had a sick baby. "I'm glad that's not MY baby" I said. It was indeed, my baby after all. HAHA. Cochise the Cockerel. This is the pic we put on Craig's List Sacramento. Coshise is now free-ranging on 5 acres with two white silkies! He went to a nice lady from Oroville. I was so relieved when the lady said she had silkies, because it meant that Cochise would be a pet and would not wind up in the stew-pot. Not that there's anything wrong with that......He would have had an awesome life even if he did wind up in the stew-pot. First play time outside (they had free run of last year's enclosed garden). Cilantro flowers and dust-baths - Yay! 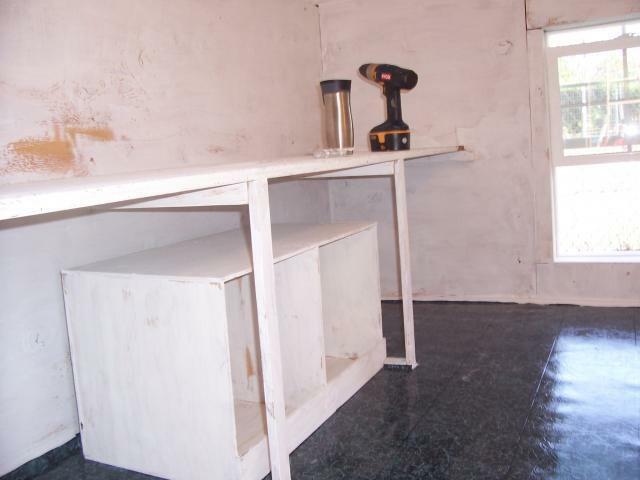 The inside of the coop in progress: That's whitewash on the walls and cheap vinyl flooring stapled down around the edges. Soooo much hardware cloth.......I expect my chickens to lay solid gold eggs in return for their secure, awesome habitat. 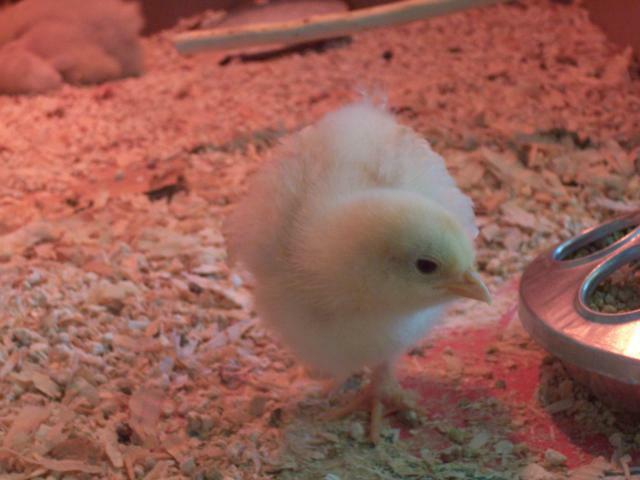 The first night in the coop! I kept them inside for one week, so they would be sure to know it's home. We put a lot of resources into keeping the chicks safe. 9 times out of 10, when I hear of someone losing a hen - it's because of a predator. Known predators in our area are: owls, foxes, racoons, hawks, and domesticated dogs. Thank goodness for a secure chicken run with hardware cloth & padlocks. Helps me sleep at night. 1/1/2010 - The peck order seems circular! Maybe I just don't fully understand it......Tammy has seemingly risen to the number one spot but is not dominating Gobbles. Gobbles is as witchy as ever toward Cordon Bleu, and I see Cordon Bleu peck assertively at Tammy when she thinks Tammy is eating HER food. ??? Because of the chickens, I am meeting more of my neighbors. My neighbor (2 doors down) came over to see the chicks last night. Her son eats 5-6 eggs a day! She had switched a while ago to free-range, organic eggs, and she was upset because she found out that even these people de-beak their chickens.......It made me feel very grateful that I have lots of room for my birds. 9/9/09 - And finally, we are getting extra eggs for the neighbors! Yay. So fun to share! 4/7/2010 - Our neighbor Matt cam over with his son Lucas and his daughter Lilly. The kids actually wanted to see the chickens. Matt had never seen them. The kids got to go inside the coop, because, honestly, what little kid can resist play-house sized places like a woodshed or a chicken coop. They got to collect the afternoon egg. Lucas stood in awe as John explained to him what this strange brown orb was......"it's an egg, you know, like the eggs you eat at home. Do you eat eggs at home? "John watched the little boys eyes light up as he put 2 and 2 together. "Do you want to take that egg home to eat?" So satisfying to help a 4 year old understand where food comes from! Cool! It also reminded me of what FUN my friend Rene and I used to have collecting eggs from Nana Updegraff's coop.